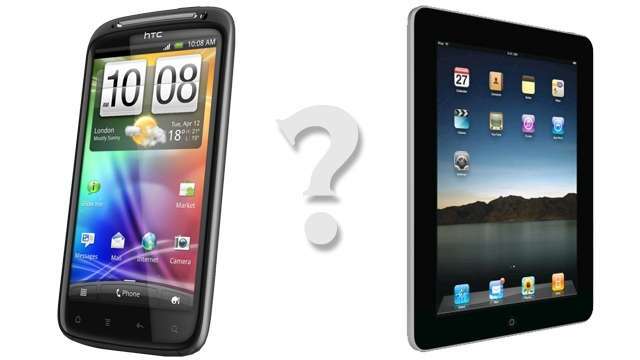 Home » Tech News » With tablets becoming smaller in size, will Smartphones lose their market share? • It brought out a mobile device that was bigger than a phone and smaller than a tablet. They called it a ‘bridge’ between the two. Why are people prepared to shell out big bucks for Smartphones? One is the status symbol aspect, sure. The other is because of its media capabilities, and being able to stay connected on the go. If all you wanted was a device to make and receive calls, you wouldn’t even dream of buying a Smartphone. A basic mobile phone would be more than enough. So now we come to a comparison between Smartphones and tablets. Both of them perform essentially the same functions; you can call, text, browse the net, chat with friends, stream movies and a lot more. The main difference is in the size. A Smartphone is a big phone and the Tablet, a tiny computer. Older users are likely to favor the Tablet as it makes reading and viewing video much easier on the big screen. It makes more sense for them to have a Tablet and a home phone. Bundling the data service for the Tablet and home phone also gives them the advantages of single billing, and probably discounts. Tablet sales will affect Laptop or desktop sales only temporarily. Personally I don’t see the point in substituting your laptop with a tiny screen Tablet. Eventually what will happen is that Laptop sales will start to pick up but Smartphone sales will drop. If you’re looking for the media and data capability factor then a Tablet is a better option; you have a bigger screen. It’s definitely more comfortable. Tablets are especially great for e-reading. Reading documents on the go is also better on a Tablet than Smartphone. It all comes down to the screen size eventually. Tablets have been used primarily at home so far, but the entry of the smaller sized Tablets like the iPad Mini, Google Nexus, and Galaxy Note, will probably change all that. However Tablets do have certain drawbacks. People who feel they need a handy device and not something cumbersome would definitely prefer a Smartphone. It is especially difficult to check routes or find a restaurant on your tablet when you’re walking on the street. The cameras on Smartphones are better than those on Tablets. Also it’s not so easy to just whip out your Tablet and snap a quick picture on the spur of the moment. Robin Mckenzie has been writing articles related to Technology News, Gadget Reviews and How To’s. Also, he does guest posting for Buycenturylink.com, a site that offers great savings and up-to-date information on consumers broadband internet and cable. Visit centurylink.com.